ก่อนเสียชีวิต เปา เจิ่ง สั่งเสียไว้ว่า "ลูกหลานเราคนใดเป็นข้าราชการแล้วกินสินบาตรคาดสินบน ห้ามกลับคืนมายังบ้านเราและห้ามเผาผีร่วมสกุลกันอีก ใครไม่นับถือคุณงามความดีอย่างเรา เราไม่นับเป็นลูกเป็นหลาน"
↑ Song Shi, ch. 316. 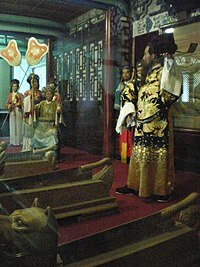 ↑ 2.0 2.1 2.2 2.3 2.4 "Bao Zheng". China Culture. 2012. Archived from the original on 2013-05-15. สืบค้นเมื่อ 2013-05-29. ↑ 3.0 3.1 3.2 孔繁敏 (Kong Fan-Min) (1986). 包拯年谱 [Annals of Bao Zheng] (in จีน). Anhui: Huangshan Publishing House. สืบค้นเมื่อ 2012-02-19. ↑ Xu Zizhi Tongjian Changbian, ch. 168. ↑ 10.0 10.1 Xu Zizhi Tongjian Changbian, ch. 169. ↑ 11.0 11.1 11.2 11.3 11.4 11.5 11.6 11.7 Wilt L Idema (2010). Judge Bao and the Rule of Law. Singapore: World Scientific Publishing. p. xi–xii. ↑ "Bao Zheng Shi Die Shou Kai Zuo Ji". China State Finance (1): 22–24. 1960. ↑ 13.0 13.1 13.2 Susan Blader (1998). Tales of Magistrate Bao and His Valiant Lieutenants. Hong Kong: Chinese University of Hong Kong. ISBN 962-201-775-4. ↑ Idema, Wilt L. (2010). Judge Bao and the Rule of Law: Eight Ballad-Stories from the Period 1250-1450. Singapore: World Scientific Publishing. ↑ 16.0 16.1 16.2 Hayden, George Allen (1978). Crime and Punishment in Medieval Chinese Drama: Three Judge Pao Plays. Cambridge University Press. ISBN 0674176081. ↑ West, Stephen H.; Idema, Wilt L. (2010). Monks, Bandits, Lovers, and Immortals: Eleven Early Chinese Plays. Indianapolis: Hackett Publishing Company. ↑ Yang Xianyi; Gladys Yang (2001). Selected Plays of Guan Hanqing. Beijing: Foreign Language Press. ↑ Yuan Mei (2013). "Zibuyu, What the Master Would Not Discuss". Paolo Santangelo and Yan Beiwen. Netherlands: BRILL. ↑ Blader, Susan (1997). Tales of Magistrate Bao and His Valiant Lieutenants: Selections from Sanxia Wuyi. Hong Kong: The Chinese University Press. ISBN 9622017754. ↑ สมเด็จพระเจ้าบรมวงศ์เธอ กรมพระยาดำรงราชานุภาพ (2471). "ตำนานหนังสือสามก๊ก" (PDF). กรุงเทพฯ: ราชบัณฑิตยสภา. p. 15. ↑ Comber, Leon (1964). The Strange Cases of Magistrate Pao: Chinese Tales of Crime and Detection. Clarendon, Vermont: Charles E. Tuttle Company. ISBN 9810845677. ↑ สมเด็จพระเจ้าบรมวงศ์เธอ กรมพระยาดำรงราชานุภาพ (2471). "ตำนานหนังสือสามก๊ก" (PDF). กรุงเทพฯ: ราชบัณฑิตยสภา. p. 18. ↑ "Legend of Bao back on TV 16 years later". China.org.cn. 2009-07-22. สืบค้นเมื่อ 2014-01-31. ↑ "Hail the Judge". chinesemov.com. สืบค้นเมื่อ 29 June 2010. หน้านี้แก้ไขล่าสุดเมื่อวันที่ 3 ตุลาคม 2561 เวลา 18:47 น.